Our first full year of operation has been a learning curve with some disappointments but plenty of successes. We are proud to have been winners of a Heritage Angel award from English Heritage for best restoration of an industrial building. We were joint winners of the Heritage Hero award for 2014 from The Heritage Alliance and were specially commended by The Georgian Group in their annual awards. This national recognition is a tribute to all those who have worked on the project. The series of 27 craft courses planned and organised by Jen Wakefield has been popular with 234 participants. The costs were subsidised by the RHT. The courses for the next six months have been planned covering painting, sculpture, photography, willow weaving and more. Details are available on the website. 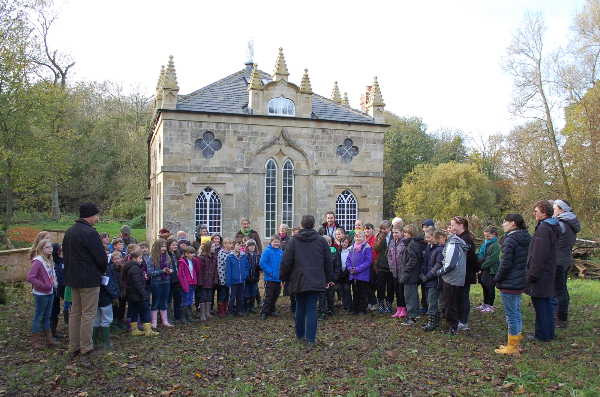 Attracting schools to visit has proved more challenging, but we have had about 500 primary and pre-school children to the island learning about renewable energy, the history of the mill and bread-making. If you are the parent of school children, please encourage the school to get in touch with us. The feedback from visiting teachers and pupils has been very encouraging. More repairs have been necessary to the waterwheel and a new bearing has been fitted to the Archimedes Screw. Overall, with favourable river levels, it has been a good year for electricity generation. Here’s looking forward to a successful 2015. Join us this coming Saturday (31st Jan) for our AGM. Find out about what has been happening over the past 12 months and what we hope for 2015. The AGM starts at 2pm. Refreshments will be provided.If you are also interested in becoming a volunteer guide or want to help with the general upkeep of the building and island then please come along and speak to trustees and other people involved with the project. We welcome you to come to a Teachers Day at Howsham Mill. On Sunday 15th and Sunday 22nd February we invite teachers to come to the Mill to find out about the exciting new educational opportunities for 2015.Join us at 12 or 2pm to meet with our Education Officer and find out about what Howsham Mill has to offer. Lunch will be provided.We will also have Hazel Canning from North Yorkshire Forest School Training. “North Yorkshire Forest School Training is working with Howsham Mill to offer Forest School Leader training at Howsham Mill this summer term. The course offered, a professional development opportunity for teaching staff, is the NOCN Level 3 Certificate in Forest School Programme Leadership, the qualification endorsed by the national Forest School Association. 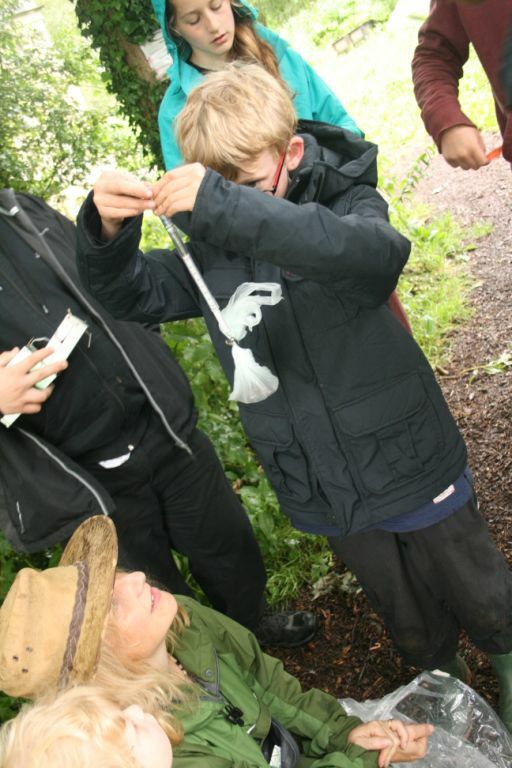 Teaching is delivered by enthusiastic and supportive tutors who are qualified teachers and Forest School Leaders, and importantly experienced in the integration of Forest School and the curriculum. North Yorkshire Forest School Training has been established for 6 years supplying high quality courses to educational establishments throughout Yorkshire and the North East. The course start date is 1st June 2015”. “Forest School will transform the educational provision on offer.” Vice Principal, Wakefield, 2014. If you are interested in attending the Teachers Day please email edu.howshammill@gmail for more information. Pre-booking is essential. This entry was posted in Newsletters and tagged Education, Environment, History, Milling, Renewable Energy, River Derwent, Teachers on March 12, 2015 by admin-7834r. Five past and present trustees went to London on Monday 3 November for the Heritage Angels Award ceremony held in the beautiful Palace Theatre on Shaftesbury Avenue. The RHT had been short-listed in the category Best Rescue of an Industrial Building, one of four categories. The show was sponsored by Andrew Lloyd Webber and he and the head of English Heritage were the comperes. The performance currently on at the theatre is The Commitments and we were treated to four numbers from the show by several of the cast. The event was run a bit like the Oscars – the nominees were announced followed by a short video made of each during the summer. And the winner is… Howsham Mill and to triumphal music two of us went up on stage to receive the award and be interviewed by Andrew Lloyd Webber. The final award was the peoples’ choice that some of you may have voted for. It was won by a group who have restored a windmill which has taken 34 years and was done entirely by volunteers – a worthy winner. Later all the contestants enjoyed an after show party at a nearby restaurant. All told an excellent evening. Wednesday 3rd Dec – Wire Christmas Tree Decorations workshop. Course costs £20. 10am – 4pm. (4 spaces left). Thursday 4th Dec – Fab Fairies workshop. Course costs £10. Morning session 10-1pm and afternoon session 1.30-4pm. Sunday 7th Dec – Christmas Craft Fair. 11am – 4pm. Free Entry. On sale will be a selection of yuletide arts and crafts all produced locally. Saturday 13th Dec – Christmas Garlands Workshop. Course costs £10. 10am-4pm. Join us for our Annual General Meeting, to be held at the Mill at 2pm. 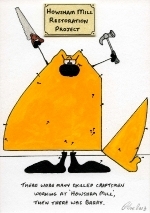 This entry was posted in Newsletters and tagged Awards, Craft Courses, Education, Environment, Milling, Renewable Energy, River Derwent, Teachers on March 12, 2015 by admin-7834r. Friends of Howsham Mill Newsletter. Summer 2014 Edition. 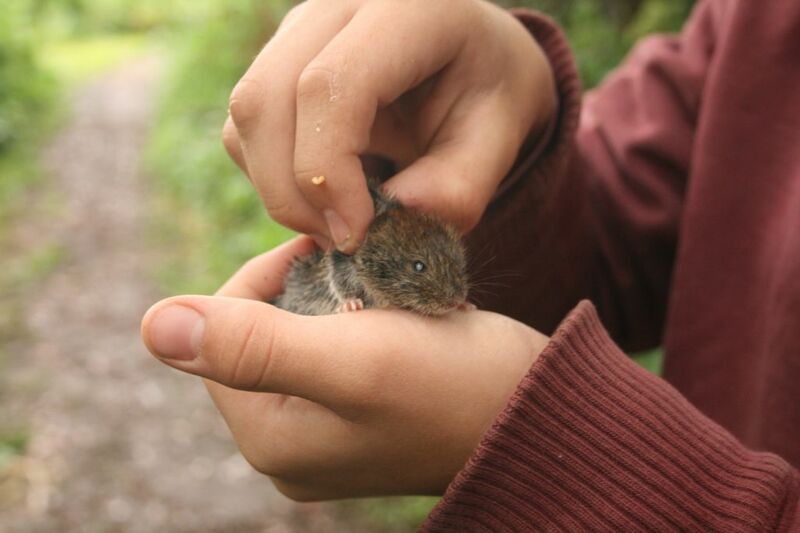 A field trip from Bootham School gave us the opportunity to try something new at the mill – camera trapping wildlife. With the help of James McConnell and Hannah Henshaw of NatureSpy.org , five camera traps were set up in likely-looking spots and left for seven nights. The cameras are triggered by movement to record short sequences of HD video – full colour by day, infrared at night. 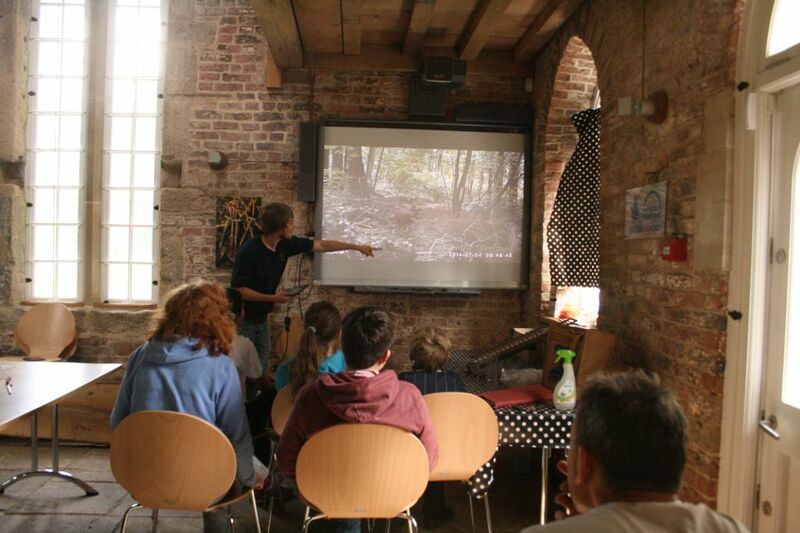 The cameras were collected in with the help of the Bootham students, and we gathered around the big screen in the mill to see what they might have picked up. The results far exceeded our expectations for a first attempt – lovely footage of roe deer families, badgers wandering the woods night and by day and drinking in the canal, a rat taking a swim, foxes and brown hares in a hurry, bank voles and wood mice going about their business and our elusive otter were all caught on film along with wood pigeons, Canada geese, pheasants, a yellow wagtail and what might be a kingfisher. The island proved itself a perfect location for camera trapping, with its variety of habitats and plentiful wildlife, and the mill itself was the perfect place to review the footage – everyone could share the excitement of watching the results unfold. The camera exercise took place in conjunction with an evening bat walk and an overnight small mammal trapping session, a combination of activities that gave our visitors a wonderful experience of the special furry fauna with which we share the site. Kids Outdoors offers a fun, nature-based day camp for children from 9-12 years old. The camp will be based in woodlands around Howsham Mill within 20 mins of York and would offer a range of outdoor activities. It’s an opportunity for kids to relax and enjoy being in nature, exploring and creating with what they find. Do they love just climbing trees or making dens? They will have the opportunity to do this. They can also take part in nature hikes and observation activities. We will learn to engage with the natural environment with all our senses – what can you hear – see – smell – feel and taste. We will learn about foraging — maybe we will make a snack out of safe natural ingredients we find in the woods! We will teach storytelling using the tools of the forest around us. Just a few of the activities we hope to cover during the week: making shelters, learning about the Mill, cooking over a fire, climbing trees, identifying plants, animals tracks and traces, mapreading, storytelling, whittling, nature crafts. 11th September – Oil Painting Class – 10am to 4pm – £15. Materials are needed so please get in touch. Pre-booking is essential. 13th – 14th September – Heritage Open Day Weekends – Come down to the Mill to find out about the historical building methods that were used on the restoration of the project. On Sunday 14th – there will also be children’s activities making lanterns. 10am-4pm. 20th September – Quilting workshop – 10-1pm – £10. 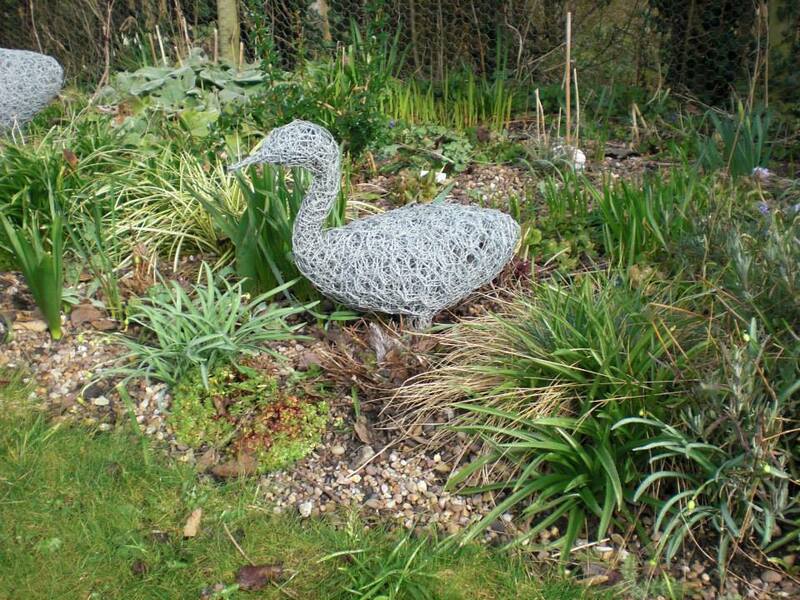 23rd-24th September Wirework Workshop – Ducks. This is a 2 day course. £40 inc. materials. Pre-booking is essential. To book on to a course please contact Jen Wakefield at jw.howshammill@gmail.com. All payments should be by cheque, which are payable to the Renewable Heritage Trust and post it to 30 Cayley Close, York, YO30 5PT. This entry was posted in Newsletters and tagged Awards, Craft Courses, Education, Environment, Forest School, History, Milling, Renewable Energy, River Derwent, Teachers on March 12, 2015 by admin-7834r. Friends of Howsham Mill Newsletter. April 2014 Edition. 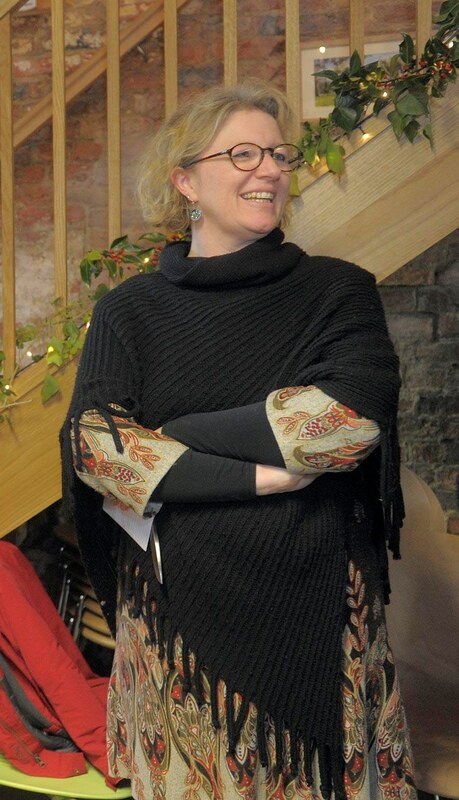 Since the last newsletter we have said good bye to Mo MacLeod as chair and trustee. After 10 years in the position, she had a good send off at the AGM in February. Her energy and commitment have been pivotal to the success of the project and she will be missed. In her final presentation to the University of the Third Age (U3A) at Kirby Misperton Village Hall in March, she spoke to over a hundred people about the story of the Mill and how far the project has come. We also welcome Amy-Jane Beer and John Renel as new trustees. We hope they will enjoy their new vocation. Spring has sprungThe island is a small area of ash woodland and after a mild winter it is showing signs of spring. The first plants to appear are the non-native yellow aconites and snowdrops, now almost over. Also coming through are green shoots of dog’s mercury, an indicator of mature woodland. Leaves of ramsons (wild garlic), wood avens, wood anemone and the triffid-like shoots of butterbur are all emerging. In places you might find the small flowers of dog violet. An all too common component of the plant community is stinging nettle, encouraged by the flooding and deposition of nutrients in the silt. You can tell the ash trees without their leaves by their black buds whereas the non-native sycamore has green buds. Ash does not produce its leaves until May and this allows the early growing ground flora to get enough light to flower and set seed. Sycamore produces large leaves much earlier and this favours more shade-tolerant plants like stinging nettle. This is why our woodland policy is to thin sycamore. Look around and you’ll see a few small oak, hawthorn, and on the banks alder and willow. Another native tree is the wych elm whose tiny pink flowers are just emerging. By April you’ll also see the large round seed leaves of Himalayan balsam, an unwanted invasive alien. Why not come later in the summer and help pull a few! Easter Holiday craft activities (12th, 13th, 19th-21st). See website for details. 4th – Quilting workshop – £10 per person. (10-4pm). 10-11th – National Mills Weekend (10-5pm) with talks at 12.30pm each day. See website for further details. 15th – Acrylic Painting Class – £15 (10-4pm). 12th – Landscape Painting – £15 (10-4pm). 14th – Quilting workshop – £10 (10-4pm). 21st – Paper making workshop – £15 (10-4pm). 28th – Book making workshop – £15 (10-4pm). This entry was posted in Newsletters and tagged Craft Courses, Education, Environment, History, Milling, Renewable Energy, River Derwent, Teachers on March 12, 2015 by admin-7834r. Many of you will have by now visited the mill and seen that it is fully restored. Work started last summer on 11 June 2012. The first task was to get all the scaffolding and heavy items to the island. Permission to use the track across the field was given by the Hall owner and Stephen Pickering, the main contractor, hired the services of Chris Wadsworth and his horse drawn log carrier to do this. Two days later the first batch of materials was on site and the scaffolding went up, including a bridge over the canal at the site of the old swing bridge.One of the first of many decisions was the choice of stone to replace all that was missing from the roof and to replaced damaged stones. The first choice was from a quarry in Sussex as it was the best match visually and geologically (a calcareous sandstone). The only problem was the price – more than budgeted and in the first month, the bulk of our contingency would be spent. Some serious negotiation resulted in a deal both sides could accept and the stone was ordered, using existing pieces as templates. All stone was cut to size at the quarry and finished on site.While waiting for the stone, work started on taking down and rebuilding more securely the upper courses of brick and stone, raking out and pointing internal and external walls and meeting sub-contractors on site. Houghtons of York designed the roof timbers and measured up for the first floor beams, stairs, doors and windows. Listers of York considered how best to fit in the wiring, light fittings and sockets to add neatly electricity to the building. By mid-August the first delivery of stone had arrived, once again brought across the field by horse and cart and across the bridge, the first horse on the island for more than 60 years. A hoist arrangement had been set up and all the pieces of stone for the upper string course were lifted by block and chain to the scaffolding platform, wheeled to position on a small trolley and lifted into place. Once the stone and brickwork were secure the English oak wall-plates that sit on top of the brick could also be hoisted up into place and tied together at the corners. Onto this frame went the four hip beams that met and slotted into a wooden boss at the apex of the pyramid-shaped roof. This was quite a challenge and needed all the ingenuity and strength of both Stephen’s team and men from Houghtons. This coincided with the first of what would be four floods of the building during the restoration. But no damage was done and once the water had subsided, the site was quickly cleaned up and work started again. A major breakdown of the waterwheel had recently occurred; the 150 year old cast iron shaft had sheared. It had to be taken out horizontally from the wheel chamber using scaffold frames and blocks and chains and out of the building, no mean feat, all while building work was going on around. The two main beams supporting the first floor had been dragged to the island, each weighing about 1 t. Lifting these required the use of a mechanical lifter, the only time one was on the island. It put each beam onto rollers on a frame where it could be slid through a hole made in the north side of the wall to a frame inside the building and fixed in place in the wall. With all the roof beams in place, Geoff Neale’s team of roofers could make a start with fixing the reclaimed Burlington slates and all the complicated lead work. Inside the preparations for the floor started. It would have a layer of insulation material of leca balls, a layer of limecrete (lime used instead of cement), coils of plastic pipes for an underfloor heating system, another layer of limecrete and finished with reclaimed York flagstones, with a slight fall to the south so that water would drain out after a flood. All materials were brought to the island, but due to the high level of the river and rain forecast, Stephen decided not to lay the floor just then. This turned out to be a wise decision as the river continued to rise and peaked on 28 November when the water just covered the window sills, a flood as high as any in living memory. After more than a week off site and cleaning up, work began again on a limited scale and it was not until after Christmas (and another flood) that the first part of the floor could finally be laid. There then followed a cold snap that prevented work outside as it was too cold to work with stone and mortar. Inside the first fix electrical was agreed and Listers started work. Then everything came to an abrupt halt with yet another flood. An improvement in the weather in February lifted morale and work could start again in earnest. The flagstones were laid, the electrics installed, the final delivery of stone arrived that included the ornate crocketed finials, the roofers returned and finished slating and the lead work. Underneath the roof, insulation was fitted and it was underdrawn with wooden panels. All the electrics have been neatly fitted behind panels, within beams or where exposed on walls, the copper cabling used matches the old bricks perfectly. A new waterwheel shaft had been made and brought to site and was fitted with two new bearings and connected to the gearbox and generator. A new statute of Diana the goddess of hunting had been commissioned from the sculptor Nikki Taylor. Diana arrived and was proudly installed on a lead-covered, steel plinth at the apex of the roof. She was an instant hit. Illuminated by four spotlights from the four corner plinths, she glows in the dark. Two down floodlights each bathe the south, east and north elevations. Inside the first floor and staircase were completed, also in English oak, and the link into the level above the waterwheel. Some of the last items to be installed were the glass floor panels above the wheel and above the end of the wheel shaft, and windows looking into the chamber. Lights beneath the glass illuminate the wheel while it is turning and have proved popular with children and adults alike. The underfloor heating system was commissioned, connected to the hot water tank heated by solar power and our own electricity. To supplement this, there is a wood burning stove in the existing hearth connected to a flue pipe up the rebuilt chimney. The new doors and windows were fitted, the latter with internal security bars and external Perspex to prevent vandalism, a sad fact of life we have to live with. Inevitably the final touches took longer than expected. It was in mid-August that building control approval was granted and we had a finished building, within budget. The quality of the workmanship is excellent and all those involved in the restoration can be proud of their contribution. Already the mill has won the Ryedale Rural Green Award and Stephen Pickering and his team won the York Guild of Building team craftsman award. The Renewable Heritage Trust welcomes all to their AGM on Saturday 1st February at 2pm. 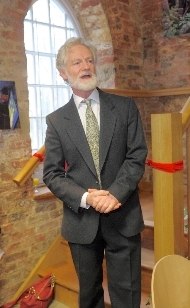 The Mill was officially opened by Fiona Spiers, head of the Heritage Lottery Fund Yorkshire and Humber on the 14th December 2013. (Fiona Spiers – Cutting the ribbon – Photo: Tony Bartholomew)The event was the chance for The Renewable Heritage Trust to thank all those who were involved in the 10 year long project. Speeches were also heard from Sir Frederick Strickland-Constable (Patron), and Mo MacLeod (Chair). The Mill had a successful Christmas Fair with stalls from numerous crafts and artists from the local area. Our Events & Education Officer has been hard at work putting together the new Events Programme for the Mill. Events include: Craft activities by two local artists, Climate Week 2014, National Mills Weekend, Real Bread Campaign, World War I Commemoration and many more. Keep up-to-date on our website. The website is currently having some work done to it, so please don’t be alarmed if the information stated above isn’t on it…it will be within the next week. This entry was posted in Newsletters and tagged Awards, Craft Courses, Education, Environment, History, Milling, Renewable Energy, River Derwent, Teachers on March 12, 2015 by admin-7834r. Welcome all Howsham Mill supporters to our first e-Newsletter. We have had a busy year so far at the Mill, with the build only being completed in August. A steady amount of Events ranging from mosaic making to fence building, puppet theatre to stone carving have kept the building in good use over the summer months. We have sadly said goodbye to Liz our Events & Education Officer who has moved on to pastures new, but we welcomed Jen Wakefield to the post earlier this month, we are confident she will fill the shoes nicely and has jumped straight into organising the Christmas Fair and Grand Opening with the Trustees early next month. 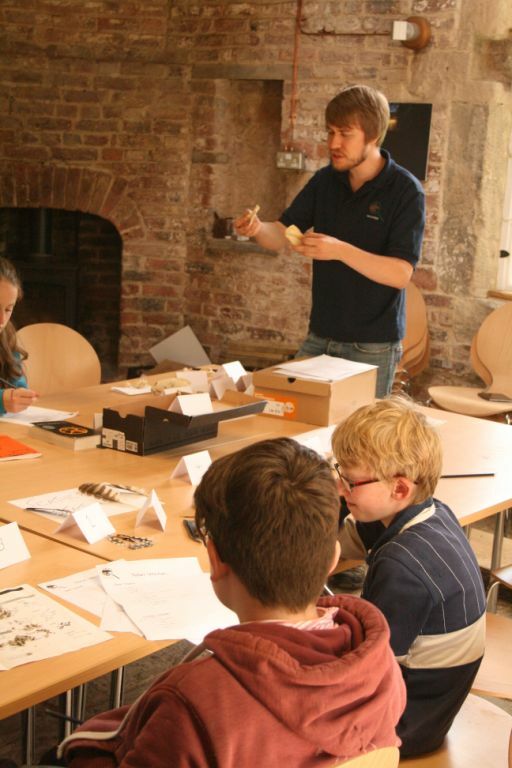 On Saturday 23rd the Mill is taking part in the Kids in Museums – Take Over Day 2013. The Norton Wildlife Watch group will be talking to visitors about how you can make your garden ready for winter with activities making habitat hotels and looking at the habitats on the Island. So come on down to the mill this Saturday between 10.30-3pm. We welcome one and all to our Yule-Tide festivities on the 8th December. With a selection of craft stalls and copious amounts of Mulled Wine and Mince Pies, come and see the Mill in its completed glory and celebrate with us the end of a fantastic year. Opening time is 10.30-4pm. Parking is available near the site.